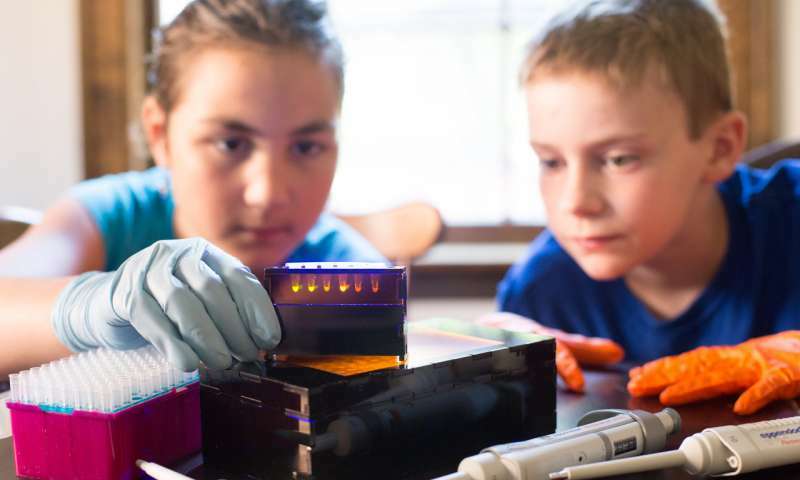 Hands-on learning is known to be more effective for teaching science to students, even the most basic molecular and synthetic biology experiments require equipment far beyond an average classroom’s budget and bacteria and other substances that can be difficult to manage outside of a controlled laboratory setting. Now, a collaboration among Northwestern University, the Massachusetts Institute of Technology and the Wyss Institute at Harvard University is aiming to solve this problem with BioBits, new educational biology kits that use freeze-dried cell-free (FD-CF) reactions to enable students to perform a range of simple, hands-on biological experiments. The BioBits kits introduce molecular and synthetic biology concepts without the need for specialized lab equipment, at a fraction of the cost of current standard experimental designs. “We wanted to create low-cost, educational kits that can be used in the classroom for less than $100,” said Michael Jewett, the Charles Deering McCormick Professor of Teaching Excellence and associate professor of chemical and biological engineering in Northwestern’s McCormick School of Engineering. Synthetic and molecular biology frequently make use of the cellular machinery found in E. coli bacteria to produce a desired protein. But this system requires that the bacteria be kept alive and contained for an extended period of time and involves several complicated preparation and processing steps. The FD-CF reactions pioneered in Collins’ lab for molecular diagnostics combined with innovations in cell-free synthetic biology from Jewett’s lab bypass this issue by removing bacteria from the equation altogether. This collection of molecular machinery is then freeze-dried into pellets so that it becomes shelf-stable at room temperature. To initiate the transcription of DNA into RNA and the translation of that RNA into a protein, a student just needs to add the desired DNA and water to the freeze-dried pellets. The researchers designed a range of molecular experiments that can be performed using this system, and coupled each of them to a signal that the students can easily detect with their senses of sight, smell or touch. The first, called BioBits Bright, contains six different freeze-dried DNA templates that each encode a protein that fluoresces a different color when illuminated with blue light. “Challenging the students to build their own in vitro synthetic programs allows educators to start to talk about how synthetic biologists might control biology to make important products, such as medicines or chemicals,” said Jessica Stark, an NSF Graduate Fellow and graduate student in Jewett’s lab who is co-first author on both papers. An expansion of the BioBits Bright kit, called BioBits Explorer, includes experiments that engage the senses of smell and touch and allow students to probe their environment using designer synthetic biosensors. One experiment, for example, uses a sensor that glows fluorescent when in the presence of banana or a kiwi DNA. Another experiment creates a compound that smells like bananas. The third experiment results in a squishy hydrogel, which students can touch and manipulate. Researchers tested their BioBits kits in the Chicago Public School system and noticed that students and teachers could perform the experiments with the same success as trained synthetic biologists. Jewett said, “We have been so lucky to partner and work closely with the Office of Stem Education Partnerships at Northwestern, who have a deep network of collaborators and know-how to connect to students in the Chicago area.” The team next plans to refine the kits’ design and create an open-source online database where teachers and students can share their results and ideas to modify the kits to explore different biological questions. Michael Jewett is a resident faculty member of the Chemistry of Life Processes Institute, Northwestern University’s singular hub for early-stage biomedical discovery and a catalyst for broad collaboration across scientific disciplines.